On February 23 the Spanish parliament approved by a simple majority the new and controversial abortion law, which allows adolescents aged 16 and above to have abortions without parental consent. The new law, pushed by the Socialist government of José Luis Zapatero, also allows abortion to be performed up to the 14th week of pregnancy and up to 22 weeks if there is a serious risk to the life of the baby or the mother. Abortion had first been authorized by law in 1985 and sanctioned by the King. A great popular mobilization took place both then and now, first to prevent the parliament from passing these iniquitous laws and then to ask the King not to sanction them. Then as now, the law was passed and also sanctioned by the monarch (whose ancestors, for their fidelity to the Church were once given by the Holy See the title of Catholic Kings). Fr. Ángel David Martín Rubio, a Spanish priest from the Diocese of Coria-Caceres, a professor of Church History at the Theological Institute Virgen de Guadalupe and at the Diocesan Seminary of Caceres, wrote a series of articles analyzing the attitude of the bishops in relation to Catholic lawmakers and to the King. “Sometimes people try to shirk their higher responsibilities as if the role of public authorities were limited to that of witnesses, registrars or notaries of the ‘people’s will’. They will see. God is not fooled. … Those who have established the abortion law are conscious and unrepentant perpetrators of what the Pope calls a ‘most serious violation of the moral order’, with all the grave and harmful consequences of social scandal. It is deplorable that the absurd idea is spreading among Catholic politicians and authorities that they can govern or legislate without obeying the Law of God. “Obispos españoles y aborto: la historia se repite” at http://www.religionenlibertad.com/articulo.asp?idarticulo=7373. 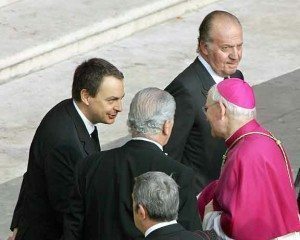 Article “‘The world is watching!’ Pro-Life Leader Challenges Spanish King to Defend Life in Upcoming Decision” at http://www.hli.org/index.php/news/press-releases/805?task=view. “Obispos españoles y aborto: la historia se repite” at http://www.religionenlibertad.com/articulo.asp?idarticulo=7373 (our translation, our emphasis). Cf. “Formal and Material Cooperation” in Ethics & Medics, June, 1995. Retrieved from http://www.consciencelaws.org/Examining-Conscience-Ethical/Ethical02.html; Msgr. Angel Rodriguez Luño, “La responsabilidad moral de quien usa material biológico ilícito” [The Moral Responsibility of One Who Makes Use of Unlawful Biological Material] at http://www.usat.edu.pe/usat/capellania-usat/articulos/la-responsabilidad-moral-de-quien-usa-material-biologico-ilicito/. “The King will sanction within 15 days the laws approved by the Cortes General and promulgate and order their immediate publication” [“El Rey sancionará en el plazo de quince días las leves aprobadas por las Cortes Generales, y las promulgará y ordenará su inmediata publicación.”] Constitución Española, Titulo III, Cap. 2, Artículo 91. At http://noticias.juridicas.com/base_datos/Admin/constitucion.t3.html#). “¿Dónde estudiaron moral los Obispos?” at http://www.religionenlibertad.com/articulo.asp?idarticulo=7492. This entry was posted in Catholic Perspective by Luiz Sérgio Solimeo. Bookmark the permalink.